When Dr. Mayeda started his practice in 1977, cosmetic and implant dentistry were not even on the dental horizon. Anticipating an emerging trend that would revolutionize dentistry, he saw the importance of integrating cosmetic and implant procedures into his practice. Dr. Mayeda became one of the first dentists trained by the legendary pioneer of implant surgery Dr. Carl Misch at the Misch International Implant Institute. 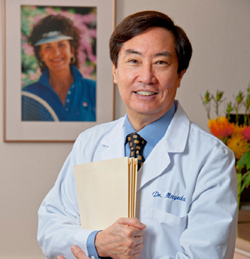 Since 1988, Dr. Mayeda has surgically placed and restored thousands of implants. Over the past ten years, he saw how digital applications would be the next wave changing the practice of dentistry, In his practice, he successfully integrated CADCAM and cone beam technology into treatment planning, surgical placement and implant restorations. After 40 years in practice, national dental consultants considered Dr. Mayeda's practice in the top two percent of the most successful practices in the nation. Besides running his practice, Dr. Mayeda became one of the early dentists to join the American Academy of Cosmetic Dentistry (AACD). He served as Accreditation and Fellowship Chairs reviewing applicants for AACD's highest honors. Recognizing Dr. Mayeda's leadership skills, the AACD elected him as the Academy's ninth national president and the first minority person selected to this position. Today, AACD has 7,000 members in 70 countries. Pursing his commitment to train other dentists and students, Dr. Mayeda became a featured conference speaker in implant and cosmetic dentistry throughout the world: Japan, Korea, China, Singapore, Hong Kong, Philippines, Monaco, Turkey and the United States. Dr. Mayeda was the co-founder of the Pan Pacific Dental Institute which provided advanced cosmetic and implant surgery symposiums for dentists from around the world. He also served as a lecturer for the UCLA School of Dentistry - Hawaii Symposium for five years. As a mentor to a new generation of young dentists, Dr. Mayeda worked as a director of an Advanced Education in General Dentistry (AEGD) residency program. He taught clinical and practice management procedures to residents launching them in their own careers. He even taught classes at a local community college to students entering the field of dentistry. Dr. Mayeda is expanding his consulting and mentoring services to his colleagues who want to enhance their clinical and treatment planning skills. He tailors his mentorships to the specific needs of each clinician and the focus of his or her individual practice goals. Consultations can be on a per-patient-case basis or on-going concierge style advice, as needed. In-office, online and phone consultations are available. My lower front teeth looked like they were disintegrating. Dr. Mayeda made 6 CEREC crowns for me in one appointment. It was cool watching him design and fabricate my crowns on the computer, then milling them right in his office. A few hours later, I was completed. I didn't have to wear any temporaries! As a retired dentist from the mainland now living on Maui, I looked for the "dentists' dentist". My wife and I were referred to Dr. Dan by other dentists and physicians. My smile went through a transformation after Dr. Mayeda conservatively matched my discolored teeth with my porcelain crowns.